Caliber II Fifty Black 184mm Longboard Trucks. Built for performance and now stripped of paint for speed .Caliber II the next generation of trucks have landed. You can carve on it, bomb hills, downhill and scare ya mum ghost white. Fifties are perfect all round truck, they have the 50 degree angle base plate which is a longboarding sweet spot. Compatible with all types of longboards. Where the bushings sit is symmetrical which means it will take any type of industry bushing. The Blood Orange bushings they come standard with are sweet, you'll love em straight out of the box. After a month or two, maybe play with some other style bushings like eliminators, or Venom downhill, or some bouncey Riptides. All those bushings will suit. 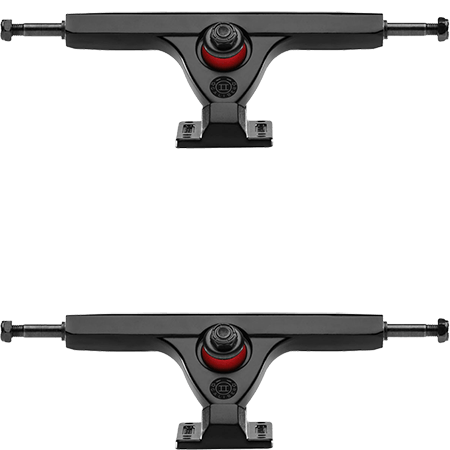 So whats changed in the next generation Caliber II trucks? Updated inner/outer steps on bushing seat -The new Inner-Step provides an increased contact area with the bushing, resulting in dramatically higher rebound and overall responsiveness. The Inner-Step diameter has been adjusted to 25.4 mm to eliminate all slop. The new Outer-Step is now a perfect circle with a 31.5mm diameter, creating a perfect no-slop-fit with oversized aftermarket bushing combinations. Pivot with tighter tolerance and updated chamfer - By decreasing our pivot cup seat chamfer, we have increased pivot cup surface area contact with the baseplate. This creates a snugger fit for the pivot pin and prevents side-to-side play as the pivot cup breaks in. Circular kingpin hole with updated diameter - With a diameter of 17.4mm, our kingpin hole has been updated to match the specs of our precision trucks. A circular hole provides a consistent and uniform lean, while also allowing proper clearance to avoid kingpin bite on the hanger. Pressed-in grade 8 hex head kingpin - We have removed all slop and play by switching to a pressed-in kingpin. This provides maximum control and responsiveness through corners, but can still be hammered out and replaced with different length removable kingpins for extra levels of customization. Reinforced baseplate - We have reinforced our baseplate by thickening the metal towards the kingpin. This provides increased strength and resistance against high speed impact. Thinner paints for tightened tolerances - Powder coats are very thick and can throw off tolerances and affect overall truck performance. We have switched over to a thinner paint system for optimal performance. We could go on and on about the design and the strengthening of the baseplate blah blah blah. You only want to know if they are worth your hard earned cash? Dont believe the Basement, believe our customers, these trucks walk out the door, and are always running out of stock. Longboarders love Caliber trucks. Plus hot chicks in lingerie love hanging around these trucks!! !